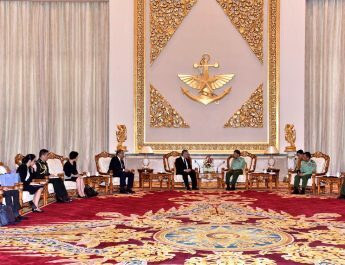 Commander-in-Chief of Defence Services Senior General Min Aung Hlaing who is on a goodwill visit in the Federal Democratic Republic of Nepal at the invitation of Nepalese Chief of Army Staff Gen. Ranjendra Chhetri, accompanied wife Daw Kyu Kyu Hla, senior military officers of the Office of the Commander-in-Chief, Myanmar Ambassador to Nepal U Tun Nay Lin and wife, Myanmar Military Attaché (Army, Navy and Air) to India Brig-Gen Thein Zaw and wife and officials, visited Lumbini Park which is the birth place of Buddha in Lumbini town this morning. The goodwill delegation led by the Senior General and wife left Nepal Army Mid Air Base in Kathmandu by special aircraft of Nepalese Armed Forces. On arrival at Lumbini they were welcomed by Commander of Mid Western Division Maj. Gen. Rajeudra Karki and wife. The Senior General and party then looked around the Maya Devi Temple built at the birth place of the Buddha in the park. After paying respects, they offered gold foils. They then visited the pond where Maya Devi had a bath, Asoka Pillar of Lumbini and the Lumbini Park and signed the visitors’ book. 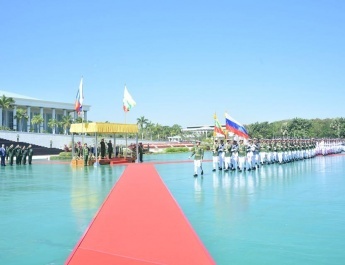 An official of the park presented a Buddha Statue as a Dhamma Gift to the Senior General who made cash donation for the renovation of the park. 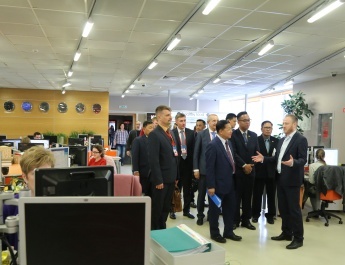 On arrival at Panditarama Lumbini International Vipassana Meditation Center, the Senior General and party viewed the places of Yogis to practise meditation. Abbot of the center German Ashin Vivekananda and Nun Daw Baddamanika conducted them round the center. 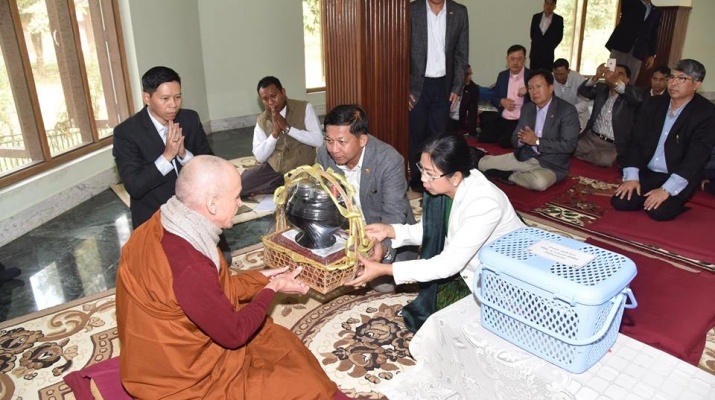 The Senior General and wife offered cash for nine prerequisites and donations to the Abbot and the Nun after the Senior General and party took the Five Precepts from Sayadaw Ashin Vivekananda. Then, they shared merits gained. Panditarama Lumbini International Vipassana Meditation Center was established by Ovadacariya Sayadaw of Panditarama Shwetaunggon Sasana Meditation Center Ashin Panditabhivamsa who was one of disciples of Mahasi Sayadaw of Myanmar. The centre is kept open all the year round to teach meditation methods to Yogis. At present, a total of 35 Yogis from 17 countries are practising meditation at the center. 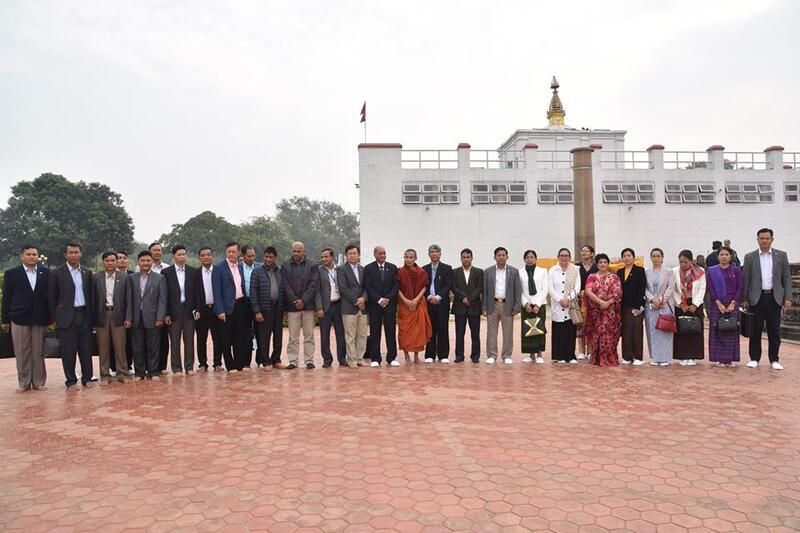 The Senior General and party paid homage to Lawka Manicula Pagoda and visited it clock-wise. 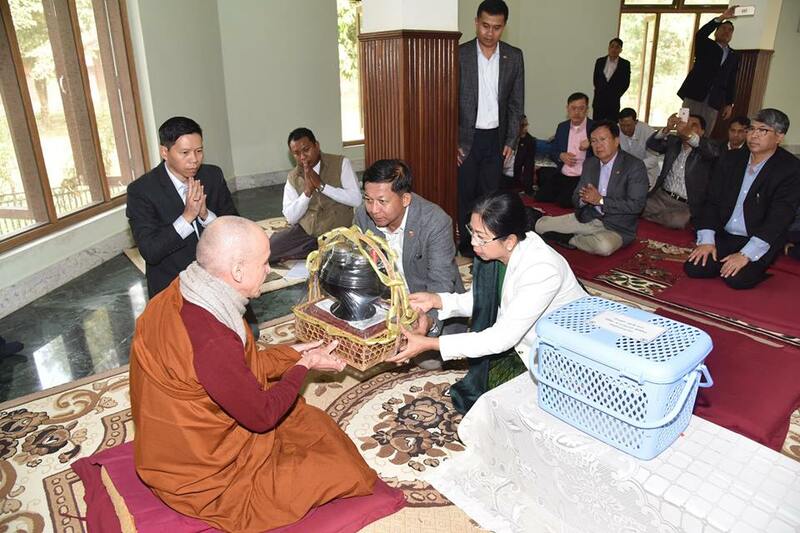 At Myanmar Shwekyaung monastery, the Senior General offered cash for nine prerequisites and donations to Abbot Sayadaw Ashin Vijjananda after asking about religious affairs. The Senior General and party proceeded to ancient Kapilvastu city in Kapilvastu District and visited the ancient city where officials conducted them round the city. 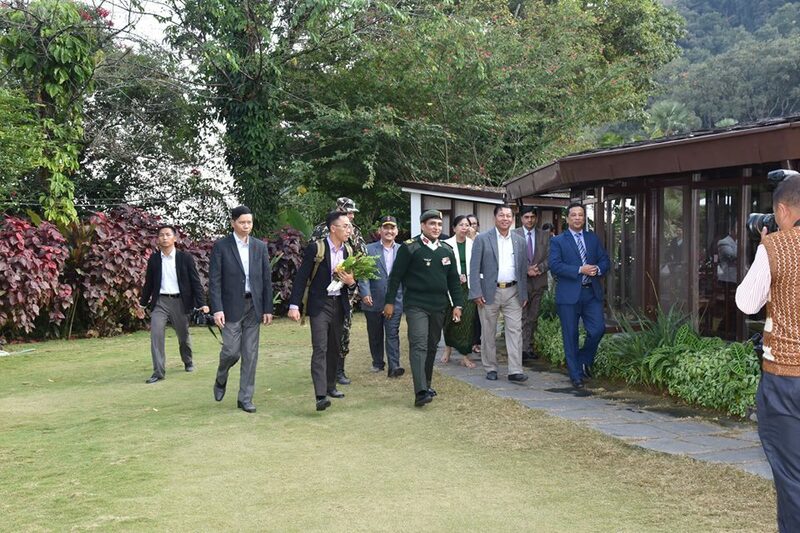 On arrival at Pokhara city, the second largest city of Nepal, the Senior General and party visited the urban area. Pokhara city of Nepal having pleasant environment is attractive to the largest number of globetrotters in Nepal.